The Union is promoting more “beyond the county” news. But it needs much more careful editing and expertise to handle the task. As a reader here noted: “They cut and pasted an AP story and didn’t get it all. It cuts off at “’In July. 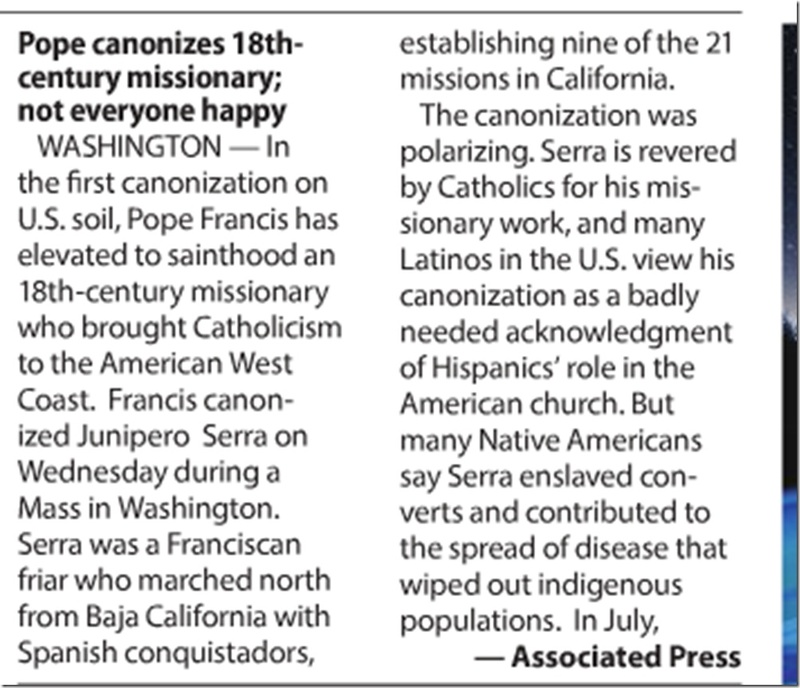 '” Here’s what the editing left out: “In July, Francis issued a broad apology for the church’s sins against indigenous peoples.” (see screen grab below). The more in-depth, staff-written account in the Bee is here. Meanwhile, the silliness on The Union’s Op-Ed page continues with “those who reject mainstream climate science” (new AP style) filling up the “letters to the editor” page. This time it’s Bob Hren, who just had a letter published on the topic on Sept. 4 (less than three weeks ago). This is so ridiculous: with 60K people in our western county, you know people have more on their mind. The Op-Ed page increasingly shows the divergence between The Union’s readership and the community as a whole. Did you catch Michae E. Mann’s scourging take down to Norm Sauer’s inaccurate diatribe about climate science published in The Union the next day? Michael Mann is a pioneer in climate science at Penn State. How would he have he time to do that? I wish he had replied to Rebane. The right is apoplectic over the Popes visit, yikes he may talk about feeding the poor, and taking care of the planet. Yes, the WSJ had a front page article on that topic. WSJ owner Rupert Murdoch is not a Catholic but he donated large sums to the Church, and ex-wife #1 Anna is a devote Roman Catholic.